I love love love this series. I cannot thank Annie ( Under the Covers Book Blog ) for suggesting this series to me. This book is the best of the series so far. I am in love with Will and want him for my very own! 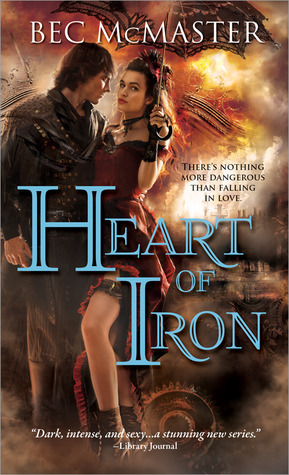 I read this book several weeks ago and for about a week after I finished it, I walked around with a Heart of Iron hangover! I couldn’t start any other books because this one was still swirling around in my head and in my heart. This book takes place three years after the events of the first book. In the first book, Lena was determined to drive Will crazy and was very successful at this task. So much so, that Will had to leave and move into his own place. He desires Lena but there is nothing on earth that could make him take her as his own. For at least a year he has managed to avoid Lena, now that she has joined the Echelon that has become that much more untouchable. When Will next meets Lena he finds a missive on her with a damning code. Will recognizes that code, he knows it belongs to the Humanists who just blew up a draining factory and almost killed Blade. Will knows Lena is in over her head. When he is called forth by the Prince Regent for a favor he realizes that his is a chance not only to free himself but to keep tabs on Lena. Lena is in way over her head, she never signed up for explosions and death. She ends up with danger all around her, without Will, she surely would have died.